This a movie review of SUNKEN GARDEN. 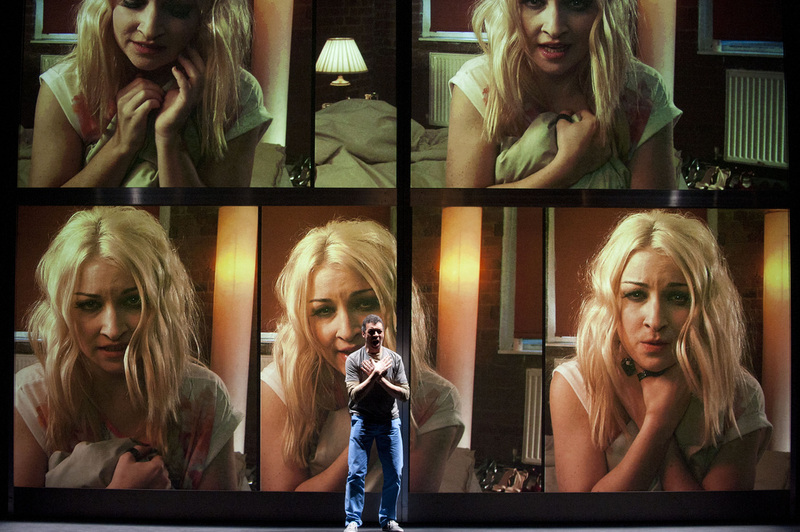 What an ambitious opera; as expected with a libretto by CLOUD ATLAS author David Mitchell. Slightly opaque yes, but narratively daring. 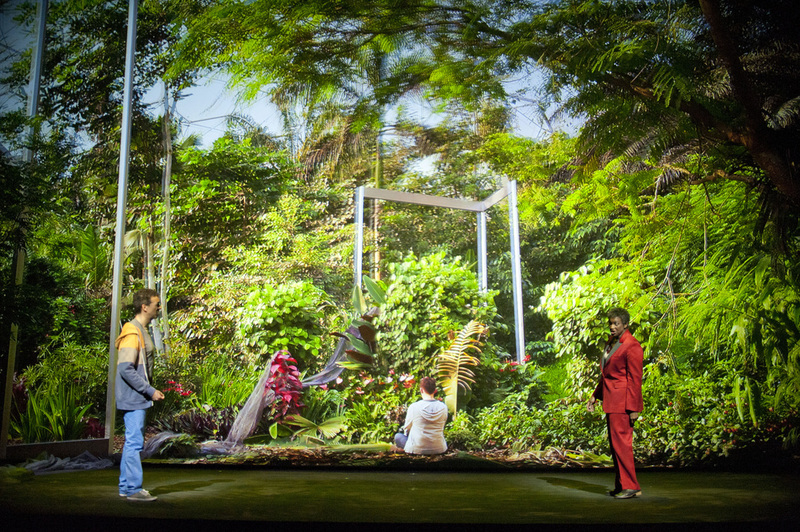 A simple set of metal frames used to hang screens, singers intermingling live with projections at first in 2D and then in 3D, this is not the usual. (We are given the specs, two kinds, one type thoughtfully made for glasses wearers to have them fit snuggly around.) The third dimension does not commence until halfway through the 110 minute runtime; the signal being “when entering the door under the flyover”. Cryptic. A word epitomising the production. 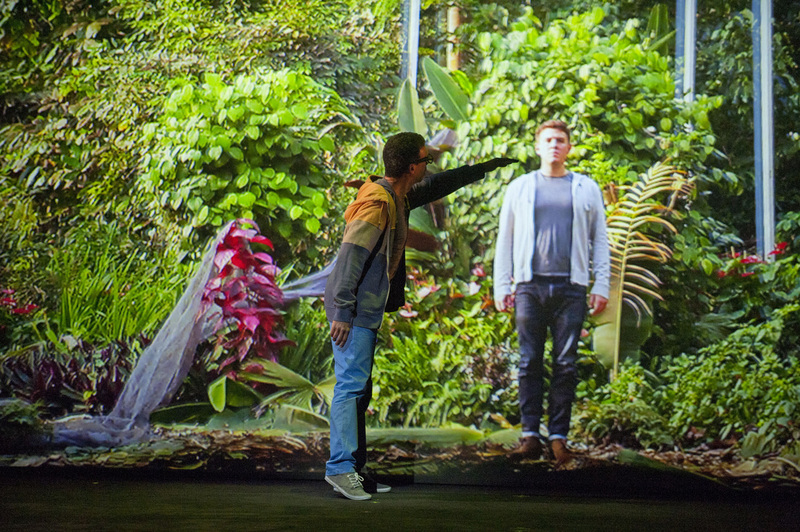 What a showcase, demoing the fantastic use for 3D technology: As a projection screen backdrop in theatres, taking the stage potentially in a myriad of directions, while making productions appear grander. - Why did he disengage from life? After the drapes are removed, a screen panel is used to show Zenna the footage Toby has created so far, consisting of interviews with Simon’s landlady, ex-wife, and friend, Sadaqat Daastani (Stephen Henry), who has unsettlingly been institutionalised. There is a question of reality, and by implication the grasp of it; and added into the fray, an encompassing of the mystical – solstices and equinoxes. From novels ALICE IN WONDERLAND and SHUTTER ISLAND to movies EXISTENZ and THE MATRIX, the territories being traversed in SUNKEN GARDEN can be compared. And of course there’s a nod to the alternate realities of Shakespeare. The stylishly energetic score heightens the pulse and helps drive the narrative. It is a detective story, where the filmmaker loses himself in a CHINATOWN-esque intrigue. While the stylings are minimalist, the canvas is epic. There is talk of the everyday “invisible war”, a notion allowing compassion with the eventual revelations. As the opera progresses a subtly increasing number of panels are used to illustrate the evidence discovered by Toby. All the while Zenna’s interest is not declared. A comment perhaps on the struggling artist willing to turn a blind eye to the motives of a wealthy benefactor. A malevolent GREAT EXPECTATIONS anyone? The analogies and nods across the arts, sans explicit comparison, are deft. Form and substance. The multi-media tools never feel gimmicky, or there to just wow, though they do when the 3D begins. 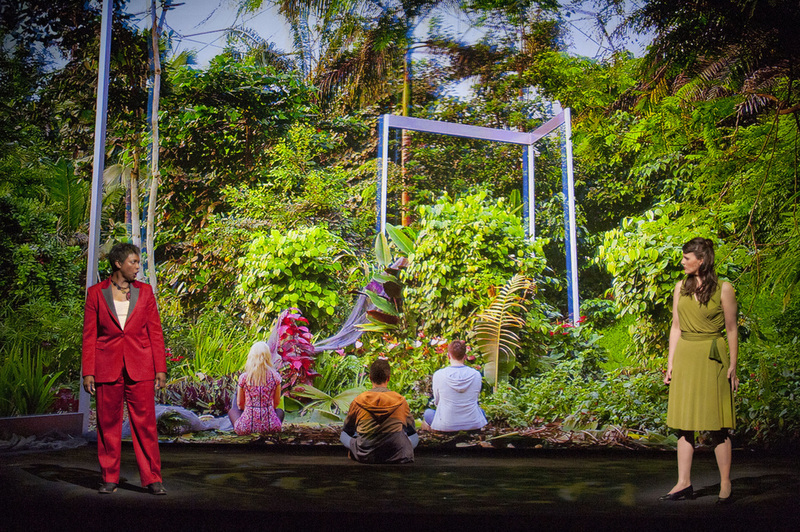 Toby’s journey does indeed take him to the ‘Sunken Garden’ under a flyover, and there the audience encounters spectacular imagery intermingling with a live cast of just three.